The Windows 7 Resource Monitor has a number of improvements over the Vista version. Whatever your previous experience, Resmon provides a quick and easy way to troubleshoot unresponsive programs and bottlenecks. Please humour me. If you are at a Windows 7 computer click on the Start orb, launch first resmon and then perfmon. My point is that in Windows 7 Microsoft has separated Vista’s Reliability and Performance monitor. I also wanted to double-check that you wanted information about the Windows 7 Resource Monitor, and not the Performance Monitor with its Data Collector Sets. 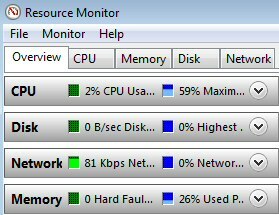 The resources monitor contains four main tabs: CPU, Memory, Disk, and Network. There is also an introductory tab called ‘Overview’. Each of these tabs also displays a chart pane, naturally, you can apply the usual intuitive Windows methods to size and position the charts to best display the data. 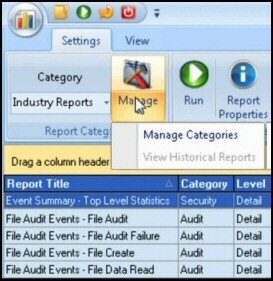 A new feature of Windows 7 resource monitoring is the ability to analyse the resources consumed by specific processes. From the CPU tab you can see check boxes next to the ‘Image’, just select those that you are interested in. You can now see an orange bar representing the selected images. The advantage of filtering is that the Resource Monitor now displays any Associated Modules or Associated Handles. To remove filtering from all tabs, right-click and clear the check box next to an Image. If your Windows 7 machine is running slower than expected, then you need to find the bottleneck. My advice is to start with memory, if Free memory is less then 50MB then this is the critical resource. However if you have over 200MB Free or Standby memory then move on to troubleshooting the CPU(s). If the CPU usage is constantly high, say over 80%, then home-in on which Image or process is hogging the processor(s). Incidentally another new feature of this monitor is that you can right-click an image and ‘End Process’, just as you can in Task manager. There is not much you can do about disk problems, other than load balance to another disk, or else replace the hardware. However, what you often find is that what seems like a disk problem, is really shortage of memory. Another possibility is that the disk is about to fail, in which case you should see loads of disk errors in the system event log. From the network tab you can see exactly what’s taking the bandwidth. Another factor with network problems is that they are likely to affect other machines, thus if connecting to local server or the internet is slower than usual check the same task but from a different computer. These are typical sources of bottlenecks, which Windows 7 Resource Monitor can help you troubleshoot. Insufficient resources are available. For example, the index service is using most of the memory. A program monopolizes a particular resource. For example a virus is tying-up the CPU. High disk activity >80% check if reading or writing that’s the problem. Wireless network, make sure that it’s not automatically downloading or loading videos from the internet. In the Windows 7 Resource Monitor you can also troubleshoot by examining the Process, Resource, Handle or Module associated with the CPU. You can also drill down to the Memory, Disk and Network tabs to investigate which processes are hogging those resources. Add more memory. Buy another SIMM / DIMM stick. Load-balancing, move some of the load to another disk. Research the true bottleneck. Beware low memory masquerading as a disk problem. 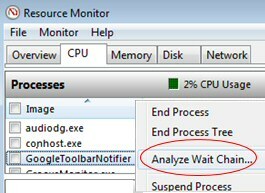 New feature: Analyze Wait Chain for unresponsive programs: Click on the CPU Resource Monitor tab. In the Image column, right-click the name of the executable that you want to analyze, and then click: Analyze Wait Chain. Run the Windows 7 Upgrade Advisor. I know this program is designed to run BEFORE you install Windows 7, but it’s unexpectedly useful AFTER you have installed or upgraded. Firstly, decide which tool is the best for your task, Resource Monitor to display statistics quickly, or perfmon to record data over time. For troubleshooting problems such as unresponsive programs: click on resmon’s CPU tab, then in the Image column, right-click the name of the executable that you want to analyze, and then click: Analyze Wait Chain.